Todd Hochberg has been a photographer in health care for 18 years. 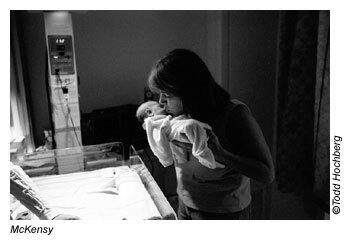 He has contributed to the bereavement program at a Chicago hospital for the past six years making photographs for parents experiencing perinatal loss. His bereavement photographs are part of the permanent collection of the George Eastman House International Museum of Photography. He received an International Center of Photography Infinity Award nomination for 2001. Hochberg presents this body of work to a variety of groups across the country, and it has been featured in LIFE magazine, Photo District News and the Chicago Sun-Times. Nancy Foley: I was reading a New Yorker article about the Vietnam Memorial designer Maya Lin the other day. Part of the concept behind her design was to make a wound in the earth, and then heal it. I remembered that notion as I looked at your images -- they are ultimately healing, yet are based inescapably on death, unexpected catastrophe, personal devastation. For the parents, looking at these images must in some ways re-open the wound and then also work to heal it. I'm wondering how you envisioned this work conceptually before you began. Todd Hochberg: My initial interest, before doing any shooting, was to connect with an early 19th century photographic tradition of making portraits of the dead and dying for families. The images of children and babies I had seen were particularly striking for me and transcended their place in time -- they spoke to me as if contemporary, evoking feelings and questions. I knew of a hospital chaplain who worked with parents experiencing perinatal loss and I wondered about contributing, by making postmortem memorial portraits as was done a century and a half ago. When I found myself in the NICU with a couple and their dying baby, I realized immediately that it would be so much more. That first time, I was swept up and into the emotion and spirit of the tragedy unfolding. The resulting photos were intimate documentary images. As I shared images with families early on, I was concerned, as you mentioned, that some might be too painful to view -- but what I heard from parents was that the photographs contributed to healing. And as time passes, the photographs help them to make new meaning of their loss. So the work has been shaped by these responses. I always work to keep families' needs up front. At one point last year, I struggled with stepping over a line, with certain images. What I discovered though, is that the photographs I made that were closer to me -- and that I thought might be tough or ambiguous for parents -- were equally powerful and important for them. I now allow myself to go wherever I am drawn. Still it is essential that I open to my feelings through my empathy in order to make the most meaningful images... and yes, these people are in the most fragile and deep emotional place of their lives. I hold much respect and reverence for this truth. It is humbling to be with them, witnessing a private, sacred time. Next page: "My ego was less apparent than my desire to tell these families' stories"